Scrunch Knots by KONG is a soft yet sturdy dog toy made of elastic plush material on the outside and a coiled rope on the inside. Available in two varieties, the raccoon and the fox. The KONG Scrunch Knots is an ideal cuddly toy for your dog. The stretchy sides and the knotted rope create natural movement and will entice your dog to have lots of fun with the KONG Scrunch Knots. The added squeak encourages playful behaviour in your dog! 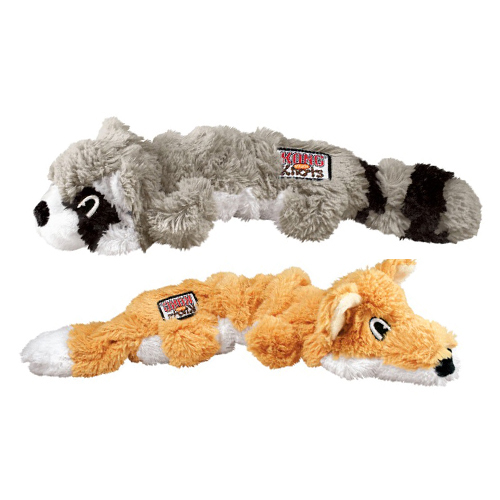 Available as fox or raccoon in two different sizes. Please note: The KONG Scrunch toys are not intended for long chewing sessions. Have you used KONG Scrunch Knots before? Let us know what you think about this product.